Want to go scuba diving? At the Fred Hall Long Beach Show, you’ll get an opportunity to take a dive and explore the underwater world — right on the Fred Hall Show floor. Deep Blue Scuba & Swim Center will have a large display at the Dive Pavilion, at the Fred Hall Long Beach Show. You can’t miss it: Just look for the giant diving mural and the pool full of aspiring divers. 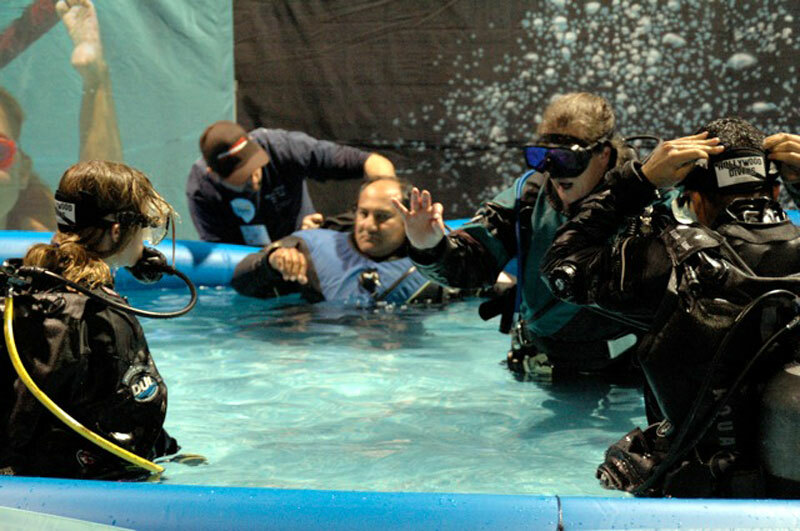 Dry suits will be on hand, so show attendees can step up, take off their shoes, step into a dry suit with all of their clothes on, step into the dive pool and get a free introductory lesson in scuba. After your dive, you can simply step out of the pool, dry your hair and go see the rest of the show. Diving was introduced last year at the Fred Hall Show, when Jonathan Hill, owner of Deep Blue Scuba & Swim Center, became an exhibitor. He and his wife, Jacquie, wanted to offer a variety of products and services geared toward opening up the world of wonder and adventure that water sports such as scuba, snorkeling, free diving and swimming provide to adults and children of all ages. It quickly became apparent that the Fred Hall attendees were “consumptive divers” — a term referring to divers who want to take things, legally, from their aquatic environment. The dive community is divided into those who just want to look and those who sometimes want to look and legally take fish and shellfish home for dinner. Up until now, there had been no “dive” show for consumptive divers. That has all changed with the addition of diving at the Fred Hall Shows. Look for this area of the show to greatly expand over the next few years. As a young boy, Jonathan Hill said he “always wanted to follow the sun rays to the bottom of the sea, to see what was down there.” He started his diving adventures at the age of 18, as a U.S. Navy deep-sea diver — and he traveled the world in that capacity, with many interesting Navy diving missions. Hill became a PADI instructor in 1989 and has enjoyed sharing his enthusiasm with students throughout the years. He also spent more 10 years as a public safety diver, conducting searches, recoveries and underwater crime scene investigations. He currently leads a specialized public safety dive team. Hill had the privilege of being one of a select handful of original Long Beach Aquarium divers and participated in exhibit preparation, prior to the opening of the aquarium. He recently pursued his interest in rebreather diving, finding a new way to interact with the aquatic world. Hill has taught scuba diving periodically through the years at the former Pacific Sporting Goods — now Deep Blue Scuba & Swim Center. Having a history in the Long Beach area that goes back four generations, which includes his father being scuba-certified in 1962 in the very pool that exists today at Deep Blue, Hill said he is truly proud to foster a new generation of divers.